Subscribe to "Privatization Watch" in English, French or Spanish. October 8, 2016 - WASHINGTON DC., 2016 IMF / World Bank Annual Meetings. 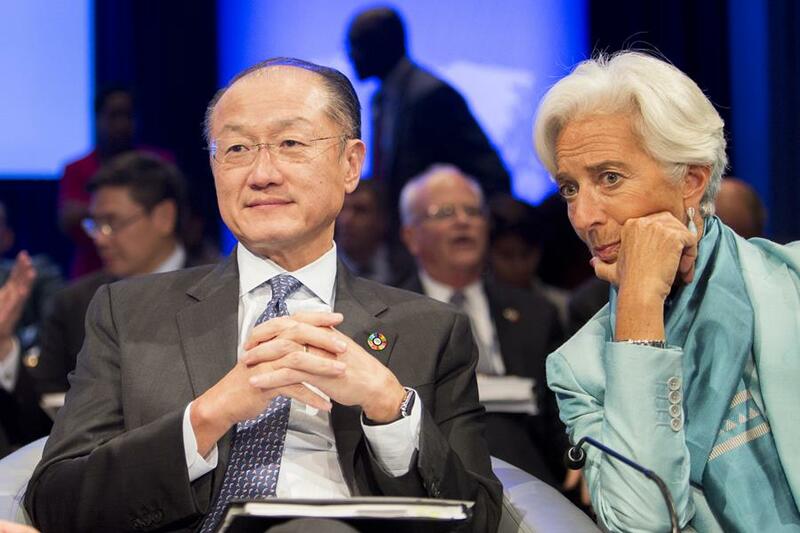 World Bank Group President Jim Yong Kim; IMF Managing Director Christine Lagarde. The World Bank and the IMF won’t admit their policies are the problem reports The Guardian. The World Bank, IMF and WTO can sense that they are sitting on the edge of a volcano that could blow at any time. They fear, rightly, that a second big crash within a decade would create a backlash leading to protectionism and the rise of dark political forces that would be difficult, if not impossible, to control. While aware of the risks, there was not the slightest hint from the IMF or World Bank during the meetings in Washington early October, that the policies they advocated during the heyday of the so-called Washington consensus – austerity, privatization and financial liberalization – have contributed to weak and unequal growth, with all the political discontent that this has caused. PSI has commissioned its research unit – PSIRU – to research and provide an overview of issues which affect local and regional governments. The report, “Overview of global megatrends affecting local and regional governments” predicts that in countries that had both adopted privatization policies and, more recently, austerity measures, the extent of local and regional government public services will soon be reduced to basic services only. The private sector is gaining increasing power and influence at local and regional government level and the future of democracy is threatened by these changes. The government is again moving to privatize its banking sector. “Analysts estimate that it is difficult to know if the privatization of banks, via IPO, will attract foreign capital. Indeed, in June 2016, the listing of a state-owned cement plant was abandoned, due to a lack of demand.”The increase in water rates could be as high as 20-30% according to current reports. PSI affiliates in the country: the Government Services Employees Association (GSEA), the Federation of Parastatal Bodies and Other Unions (FPBOU) and the Local Authorities Employees Union (LAEU) have jointly launched a campaign against privatization of water services including an awareness-raising Conference on “Quality Public Services and Water Privatization” on 15 September followed by a march along the streets of Port Louis, the capital city of Mauritius. The President of the Cameroon Federation of Education Trade Unions, Hobie Emmanuel Mbassi, says "the primary school is not free in Cameroon. Primary school is left to the parents. This is a kind of privatization of the school. We're privatizing it because it is the parents who finance it." Global Energy Research reports that although a decree was published in 2000 for the liberalization of the downstream oil sector, “to date, only the SCDP (Société Camerounaise de Dépôts Pétroliers) has been partially privatized.” But it argues that “the country wants to boost the privatization of public companies.” [Global Energy Research, 2 October 2016]. The World Bank has been promoting privatization in Cameroon for at least two decades. A concerned citizen who is fighting against the privatization of Electricity Company of Ghana (ECG) “has petitioned the US Ambassador to investigate what he says are 'unethical' and 'unlawful' acts in the whole deal involving the Millennium Development Authority (MiDA). According to Richard Asante Yeboah, there is no transparency in the proposed Private Sector Participation (PSP) in ECG to be run by [Ghana’s] MiDA.” Copies of the petition were also sent to President Obama, U.S. House Speaker Paul Ryan, he Speaker of Ghana's Parliament, both the majority and the minority leaders in parliament, as well as the Attorney General. Street protests by traders break out over a municipal “sanitation operation” in Analakely, Antananarivo. They “gathered outside the main entrance of the City Hall with whistles and banners. ‘We are against the privatization of all market locations in Tana,” their banners said. A former Director in the Budgetary Department of the Central Bank of Nigeria, Titus Okunronmu, said sale of the country's asset to boost the economy would further restrict income, as only very few would be able to buy them. Members of Amalgamated Union of Public Corporations, Civil Service Technical and Recreational Services Employees (AUPCTRE), in collaboration with Public Services International (PSI) and Environmental Right Action (ERA), have cautioned against privatizing water services highlighting that water is a human right and therefore cannot be commoditized or priced. A small delegation of representatives from the three organisations visited the FCT Water Board on 30 September to brief the FCT Water Board Management on the advantages of a Public-Public Partnership (PuP) as opposed to a Private-Private Partnership (PPP). The federal government is going to put the country’s triple-zero emergency calls service out to tender for private, for-profit companies. Western Australia Opposition Labor leader Mark McGowan vows not to privatize “part or all” of Western Power if it wins next year's state election. “Mr McGowan said if elected, he would not sell Western Power or other core monopoly assets in a bid to solve the financial problems. "Under no circumstances will we sell Western Power, Water Corporation or Fremantle Port," he said. "That is a core, iron-clad, non-negotiable commitment.” The Australian Services Union and Electrical Trades Union WA branches helped organize a meeting between politicians and Western Power employees to discuss the potential privatization of the state-owned utility. The Federal Government has just released a report introducing competition and contestability into “human services”. Social housing, public dental services and public hospitals could soon be opened to more market competition reports The Guardian. The Productivity Commission has said they are among six “priority areas” in the services sector where the quality of services could be greatly improved if people are given a greater say over how they use them. The Columbia Institute's Centre for Civic Governance publishes a major report on local government insourcing of public services. Back in House: Why local Governments Are Bringing Services Home says that across Canada and around the world public services that were once outsourced are now finding their way back in-house to municipalities, mainly because using in-house services saves money. Simply put: Privatizing services hasn’t delivered the benefits that were promised. Dozens of examples are provided, and perspectives are included from the United States, United Kingdom, France, Germany and other countries. Major cuts to budget resources allocated to the Program of Water and Wastewater (Proagua) proposed by the Federal Executive for 2017 opens the door for privatization of the service, as local authorities will have minimum resources for infrastructure construction. They will be forced to seek private financing, which is consistent with the recommendations of the World Bank and the pressures that made Conagua privatize elements of the public service in recent years. Social protest and legal action mounts against Aguakan, the licensee company for drinking water in Quintana Roo, for high charges and illegal water cuts. The Party of the Democratic Revolution (PRD) has announced the launch of a campaign to collect signatures to be delivered to the mayor, Remberto Estrada Barba, and the state Congress to request the cancellation of the Aguakan’s concession to provide potable water, drainage and sewerage systems in the municipalities of Benito Juárez (Cancun), Isla Mujeres and Solidaridad. The European Services Strategy Unit have published a new report on offshore PFI/PPP funds. The research reveals the rapid growth and power of offshore secondary market infrastructure funds - a £17.1bn industry buying and selling equity in PFI/PPP project companies. The three-way profit gain - original SPV shareholders, secondary market fund sales and shareholder dividends of secondary market funds – means the total annual rate of return could be between 45%-60% - three to five times the rate of return in PFI/PPP final business cases. The five largest listed offshore infrastructure funds made a total profit of £1.8bn in the five-period 2011-2015 but paid ZERO tax. The report recommends termination of PFI/PPP programmes, nationalisation of SPVs, increased public investment and many more policy changes. The European Bank for Reconstruction and Development (EBRD) launches a new €8 million credit line under the Belarus Sustainable Energy Finance Facility to help Belinvestbank to finance energy efficiency and renewable energy, but also to carry out a planned privatization process. National Health Service GPs are being offered thousands of pounds to give private consultations via app. Katherine Murphy, chief executive of the Patients Association, said “what this means is that NHS doctors are being targeted to give up their role working for our NHS and instead work for private companies, which I think most patients would consider unethical. When the NHS is so desperately short of GPs, how can this be right?” Last month it emerged that another Uber-style app-based medical service, Doctaly, was being rolled out nationally. Fill in this very short survey to help us to improve this newsletter. Download or view on-line past editions on our website.